This is the curry to top all curries. Betapac Curry Powder is of genuine quality and is manufactured in Spanish Town, Jamaica. BETAPAC CURRY POWDER 3.88 OZ. BLUE MOUNTAIN CURRY 22 OZ. For that true West Indian taste, used in many dishes for that exciting curry flavor! GRACE CARIBBEAN TRADITION HOT CURRY POWDER 4 OZ. Curry is a popular ingredient in Jamaican recipes such as curried chicken, curry goat meat and roti which are island specialties. INGREDIENTS: TUMERIC, CORIANDER, CUMIN, BLACK PEPPER, GARLIC POWDER, ONION POWDER & SPICES. Oriental Curry is a seasoning used to make a variety of curried flavored meals. 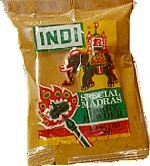 This spice is of Indian heritage.